Lady Blu is a pleasure to be aboard as she is in outstanding condition. Very clean right down to the bilges and exceptional exterior finish. 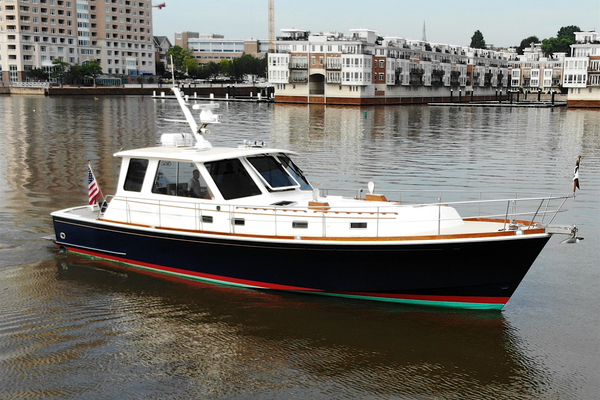 2016 Garmin electronics, twin Yanmars, bow thruster and many recent improvements by a boatyard owner make Lady Blu ready for her next cruise. Forward is the stateroom with a comfortable V-berth with filler. To starboard is the roomy dinette that converts to a double berth. To port is a full galley with refrigerator, cooktop, sink and microwave. The enclosed head compartment is port aft with vanity, shower and VacuFlush toilet. Teak trim and generous storage throughout. The bridge deck offers double helm and companion seating as well as lounge seating that can be used as bunks. Good engine room access.